It’s taken me eight months to write this blog entry. Not that I’ve spent weeks writing draft after draft, searching for mots justes; it’s been more of a distillation process, where the content needs to bubble and brew, mature over time, and the distance that gives. When Jacqui died, there were no national headlines announcing the fact, not even an article in the local rag of the area where she had lived for over 20 years. There was no display of national mourning, just ripples of grief from friends and family that spread locally, washing over people who knew her. Jacqui was an amazing person. She struggled with serious health issues, as well as being an amputee, and having bi-polar. What made her so amazing was that despite everything she was cheerful, grateful, generous, kind, and very talented. In her circumstances I’m not sure I would have been so positive about life. One of Jacqui’s enduring features was her courage in the face of adversity, her zest for life. She was never possessed by negativity, but had resilience, in spite of her lack of self-belief. Jacqui was a mum, a family person through and through, who would do anything for those she loved. She bought up a bright, cheerful, well-adjusted daughter through all the turmoil and challenge of her own life. Jacqui was full of kindness and bright ideas, and a genuine community spirit. Despite her dislike of crowds, and many social settings, she was the baking hero of her local village, and churned out thousands of bakes over the years, raising money for local and national causes alike. Jacqui managed to hold down a job, and didn’t claim state benefits, to which she would have been entitled. She forged her own way after her marriage break up, and lived independently. Jacqui was always shy of new people, but that didn’t stop her making friends, or referring herself to the befriending service where I first met her. She constantly challenged herself to do new and difficult things. She continually stretched herself and didn’t ever shy away from what she found hard. Jacqui liked Christmas, and at this time of year I remember her enthusiasm for planning, for choosing the right presents for people. As a talented baker and professional chocolatier, as well as an accomplished crafter, Jacqui was often able to make unique and memorable gifts for people. 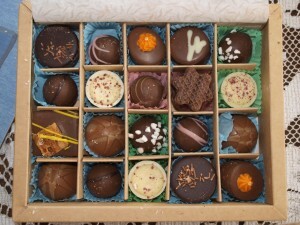 A Christmas without Jacqui, and her fantastic chocolates, will be a poorer one for sure. She was great at thinking of present ideas for people, and with the merest information could suggest a range of potential gifts. I used her skill on more than one occasion! Jacqui liked her own company and could find people hard to understand, but she always invited people for Christmas; as well as her family there would often be an elderly person, who would otherwise be on their own. Jacqui was good at putting her fears aside and doing what she felt was right. Sometimes life could overwhelm Jacqui. She could deal with most things, but when a spate of disasters came her way, the cumulative effect of circumstances and mental illness could mean she would be unable to cope. Frankly, I have no idea how Jacqui coped even with the everyday trials of life. She had a sleep disorder, which meant she rarely got more than a couple of hours sleep a night, and she was on copious amounts of medication which would have grounded most people. Inevitably there were frequent stays in the local mental hospital while she recovered her equilibrium enough to cope with the world again. I often wonder how the sleep deprivation impacted her mental health. I’m struggling with lack of sleep myself right now, and can attest to the many negative impacts it has on day-to-day living. For Jacqui this was a constant she had to endure, as despite heavy doses of melatonin, her sleep disorder was never resolved. It is testament to her courage, tenacity and resilience that she managed to get up and go to work and carry on a normal life. I know people with half the troubles she had that are unable to achieve that. When Jacqui was low, she could be really low – her complete demeanour changed and she took all the negatives personally. She felt everything was her fault and she must be a bad person. It’s very sad to see someone you care about crumple in this way due to what is thought to be a chemical imbalance in the brain. Usually energetic and motivated, Jacqui became listless, lacking in energy, and full of self-loathing. She usually had awareness that she was becoming low, and a part of her could often see it for what it was, but often the depression consumed her, and it was difficult to reconcile this person with the Jacqui I had come to know and love. During a manic episode, Jacqui was never totally disinhibited or reckless, as some people are. She became more buoyant and cheerful, and often thought of things to do that she would never usually entertain. I once remember her arranging a party for herself. Jacqui was a born organiser, so it was no surprise she liked the idea of organising a party, but there was no way she would ever be the centre of attention amid a host of people! The invites didn’t go out thankfully – she would have been mortified! Whatever frame of mind Jacqui was in she was always kind and considerate of others, and although in some of her moods she may have had an unintended impact on people, there was never any malice of intent. I liked Jacqui when she was ‘high’; on the way up you got a glimpse of the joyful ebullient character she might have been without the impediments of illness. She was less self-critical and more confident, less apologetic and more assertive. The thing about bipolar is that it subsumes your personality in some ways, and the medication can dull people into shadows of themselves. I suppose both ‘highs’ and ‘lows’ were intrinsic aspects of Jacqui’s personality, but it’s hard to know where ‘illness’ ended and the ‘real Jacqui’ started. I suppose that the truth is more complicated than that; Jacqui was not her illness, any more than someone with cancer is, but the nature of mental illness in particular affects personality in a way that other conditions don’t. Jacqui was Jacqui. She was one of the most amazing people I’ve had the privilege to know. And six years was way too short a time. She was my friend and I miss her.